IBM is suing former senior sales executive Louis Attanasio for disclosing corporate secrets related to its cloud computing business. IBM is suing former senior sales executive Louis Attanasio for disclosing corporate secrets related to its cloud computing business to a competitor, according to a report by Fortune on Wednesday. According to the report, the complaint was filed in Manhattan on Monday, suing former IBM GM for Global Sales of Hybrid Cloud Attanasio for $500,000. It is alleged that Attanasio sent confidential documents to his personal email address before departing IBM for Informatica on April 6. The emails included a series of confidential messages with his manager discussing “extremely sensitive details about IBM’s revenue targets, its performance relative to those targets, and resource allocation,” the complaint said. A long-time IBM employee, Attanasio is now employed as Chief Revenue Officer at Informatica. The company provides a range of services that compete with IBM including cloud and data integration, big data management, and data governance. Its customers include Western Union and Citrix. IBM is looking for an injunction ordering Attanasio to “honor a 12-month global non-compete agreement and to return a $250,000 payment he accepted to stay on in 2015, plus an additional $251,357 of equity compensation he recently received,” according to Fortune. Violations of non-compete agreements are nothing new in the cloud computing space as vendors look to scoop up top talent to fill in skill gaps. A couple years ago AWS sued a former employee over violation of a non-compete when he left to join Google. 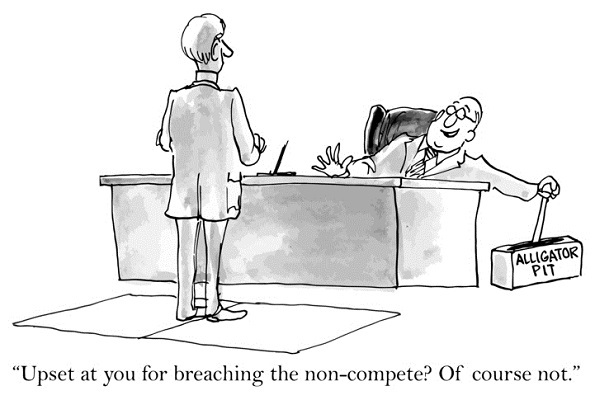 The issue comes as the White House has released a report that calls for non-compete reforms. According to the report, only 24 percent of workers and fewer than half the workers with non-competes say they know trade secrets.